The best tool for calming irritated skin – and so pretty. Massage a pea-sized amount onto clean damp skin and enjoy the velvety glow. Amber Valletta taking a turquoise bath in Prada Spring Summer 1997 campaign. Image by Glen Luchford and courtesy of Prada. Did you know that as colors, red increases heartbeat while blue has cooling and calming effects? 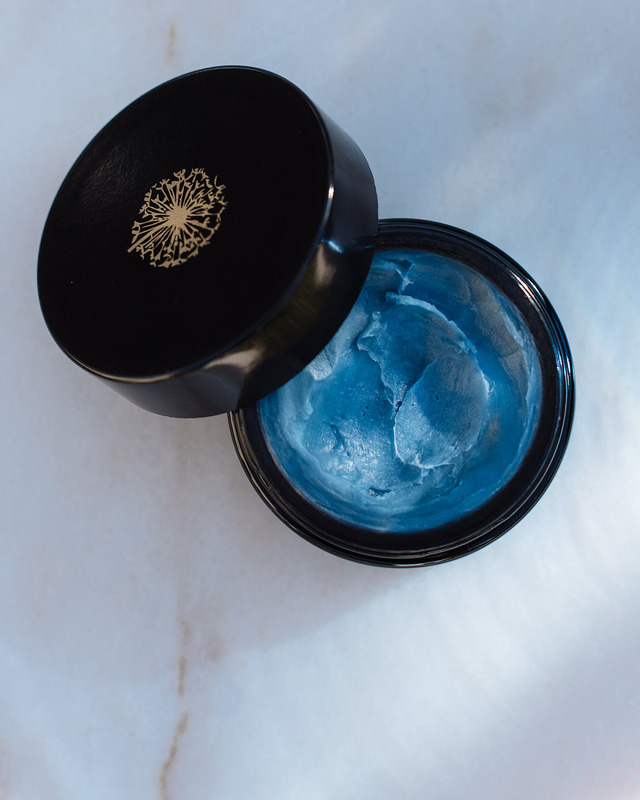 Therefore, calming irritated skin with May Lindstrom’s Blue Cocoon beauty balm is a truly holistic experience. Designed to soothe your mind and senses as well as your skin, the balm is solid in the jar but melts at body temperature. Gently massaged into skin, it provides nourishment while calming irritation, cooling inflammation and diminishing redness. Pea-sized amount morning and evening does it. Apply on clean damp skin and enjoy the velvety glow. Like all May Lindstrom Skin products, the Blue Cocoon is formulated with certified organic and wild harvested ingredients and hand blended in micro-batches for ultimate freshness. Goodbye mass producing. The stuff you purchase at May Lindstrom is only just made, and with human hands and heart. To discover more about the fantastic line, read my previous notes about it here, or continue to May Lindstrom’s site. When in Helsinki, I purchase my beauty products in Jolie Shop, Uudenmaankatu 26. A finer selection of certified organic cosmetics is not too easy to find.